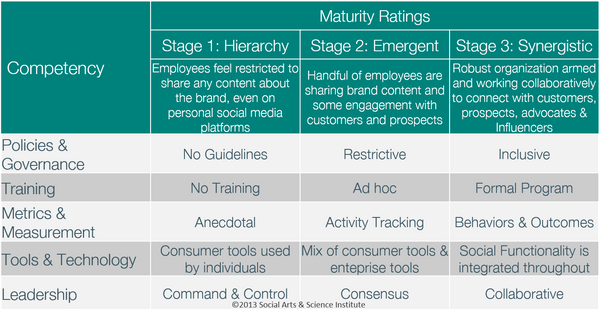 Employee Advocacy Maturity Assessment: Are you ready? Policies and Governance. A social media policy is a must. This is the foundation of how you activate employees in what they can and cannot do. If you have a policy, re-read it and see if it empowers employees. For a great example, check out Dell’s social media policy which uses real language and encourages employees to use social media on behalf of Dell (real language can be defined by no-lawyer speak). Training. We are huge fans of training employees, as they need to understand the rules of the road and best practices. They also need to understand their roles, plus what you would like for them to do. Metrics and Measurements. What are your business objectives? Why are you launching an employee advocacy program? What results would you like to see? You need to establish your objectives and tie metrics to your program. Starting off, your data may be more anecdotal, but that is okay. Anecdotal data can be very powerful, too. Tools & Technology. Tools are a must to help you drive your program, whether it is for effective measurement of the program, employee learning resources, or employee activation software platforms (SocialChorus, Dynamic Signal, EveryoneSocial, GaggleAmp, etc. are examples of employee advocacy software platforms.) Good luck trying to duct tape this program together via email. Check out the employee advocacy maturity assessment above. How do you measure up? Inspired by the great work at Community Roundtable, check out their Community Management Maturity Assessment.